Seven music majors performed in the first of four applied music recitals that were held as a part of the final grade for applied music majors. Performers were able to select a piece of music from a list provided by the music department to practice. They were also given the option to perform solo or be accompanied by another musician. Nick Stefanyshyn played J.L. Small’s “27 Melodious and Rhythmical Exercises” on a tenor saxophone. Stefanyshyn was the only performer of the seven that did not have a musician to accompany him on stage. 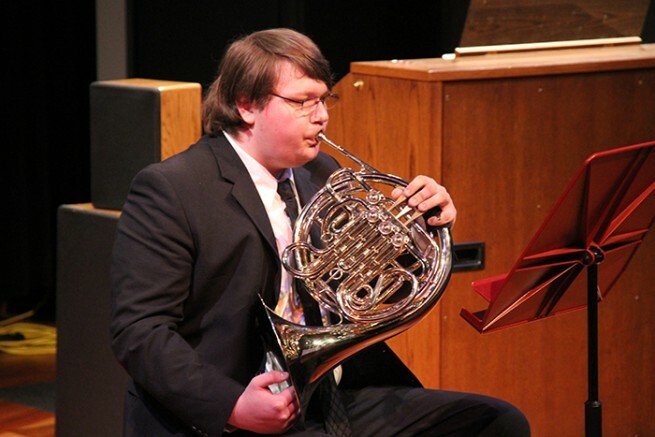 Casey Reynolds, a euphonium player, started practicing his music with ARC professor Susan Hamre a month prior. “These past couple of weeks have been more of polishing off the piece rather than just hard ‘what is this piece supposed to sound like?’,” Reynolds said. Efren Fuentes performed the first movement of Bach’s “Sonata No. 4 in E Minor, BWV 1034” on flute, accompanied by professor Susan Hamre on piano, who also plays piano for the rest of the performers. Vocalist Gabe Catabran performed two pieces, Mozart’s “Deh Vieni alla Finestra” from the Don Giovanni opera, and “The Sea” by Edward MacDowell. Jonathan Ponce performed “Concertino Op. 26” by Carl Maria von Weber on clarinet. “I had one moment when I forgot the words which hasn’t happened in rehearsal, but I recovered relatively well,” Preston said. Casey Reynolds was the last act of the concert, which she performed Fernando David’s “Concertino for Trombone Op. 4” on euphonium. Hamre, who directed the concert, described the difficulties students have while performing in front of their peers. “Performing in front of your peers is as nerve-wracking as it gets,” Hamre said. The remaining recitals will also take place in room 547 on Dec. 3 at 7 p.m., Dec. 4 at 12 p.m. and Dec. 7 at 3 p.m.
Be the first to comment on "Student musicians play for peers"